Lima Fire Department responds to a fire at Sixth Street and Central Avenue on Friday. The fire is under investigation. 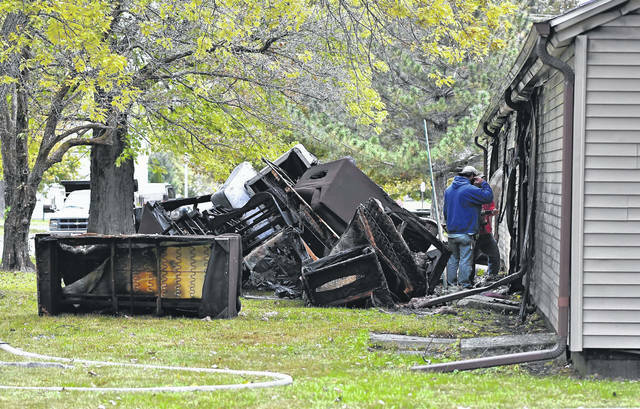 LIMA — A storage building on Lima’s south side was damaged by fire Friday afternoon. According to Brian Stewart, captain at the Lima Fire Department, Lima Police received a 911 call at 2:11 p.m. about the fire at 300 E. Sixth St. When crews arrived, they found smoke coming from the eaves of the building, which was used to store furniture. Shawnee Township Fire was called to assist Lima Fire in battling the blaze. Damage was listed at $17,500.